e obtained a rare lot of 21 North Vietnamese Army documents all carried by a single PAVN soldier. 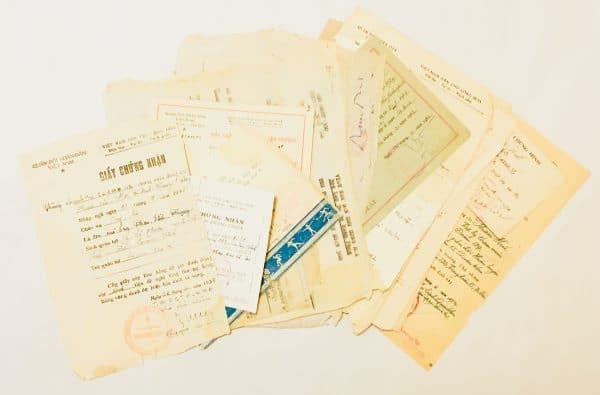 The varied documents span his career in the North Vietnamese Army from 1945 to 1972 when he was likely killed or captured. His name was Pham-van Hue. He was born in Quang Binh Province, which is North of the 17th Parallel, in either 1927 or 1929 (the year varies between documents). He joined the Viet Minh on September 23, 1945 at the age of either 16 or 18. He served in various NVA units and locations. He received two medals for his service in the Viet Minh during the anti-French War. After the Anti-French War, he served the longest with the 330 Division. The 330th consisted of Viet Minh soldiers who moved North after the Anti-French War. He was likely an enlisted man in the Viet Minh but became a sub-lieutenant (2nd Lt), platoon leader, in the late 1950s. He went to a formal 13 month officer training school in 1962. He was later promoted to First Lieutenant and appears he retained that rank for the rest of his career, likely owing to his lack of formal education. It appears he served the longest with the 330th Division, 568th Regiment, 7th Bn, 12th Company. Our research shows that the 7th Bn of the 568th Regiment, later became the K2 Battalion of the VC Dong Nai Regiment. After the 568th Regiment, he was also associated with the 584th Regiment, the 15th Regiment and unit 2060 (an NLF-NVA encoded unit designation). The gaps in the records make it difficult to say where he served in the South. As you know, most VC Main Force units were lead by a Cadre of former Viet Minh and NVA Regulars. Later in the War, mostly after the Tet Offensive if 1968, many NVA units which moved to Nam Bo, also called the B2 Front, were redesigned as VC Main Force units by the stroke of a pen. One record, an ID card, dated 1972 clearly shows him in the B2 Front (RVN). The documents we have listed here include his identification papers, awards, promotions, training, transfers and other military records. As is standard, most of these documents have “Peoples Army of Viet Nam” in the upper left Corner; “Democratic Republic of Vietnam” in the upper right, and “Independence, Happiness and Freedom” under that. Most have his division or Regimebt noted in the upper left as well. All document have his name, unit, date, signature of the officer authorizing the action noted, a rubber stamp, order number and all the military bureaucratic markings found on military documents everywhere. We suspect he was either killed or captured, or, in the alternative, his records were captured, late in the war at some time prior to the US withdrawal from RVN in March 1973. This sort of dossier would have been carried either by Phan-Van Hue as proof of what he had done in his career, they weigh only a few ounces, or by a unit clerk, owing to his rank as an officer. 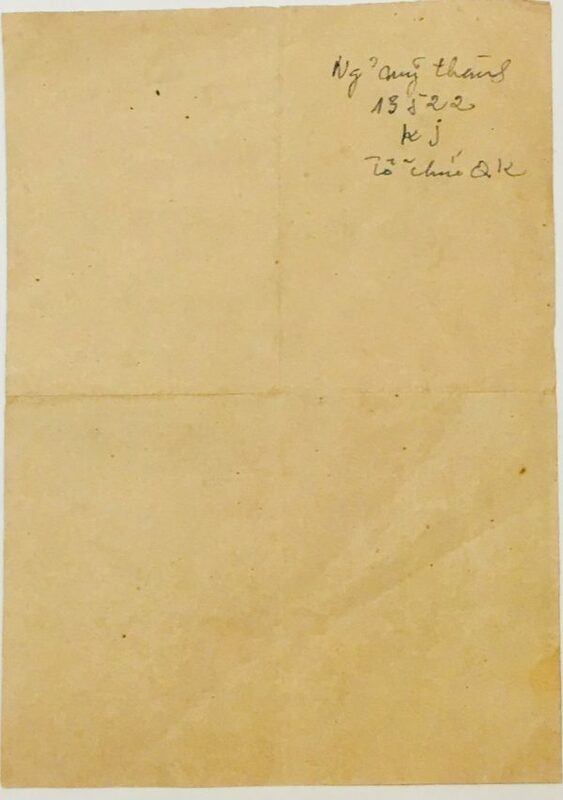 This type of material was invaluable to the intelligence community to document the movement of units or for use during interogation of a POW. At some point they are no longer actionable and could be kept by an Intel type. The average grunt would be required to turn such S-2 documents into his unit command. Regardless, this is a treasure trove of rare, never before seen, documents to one NVA career soldier. 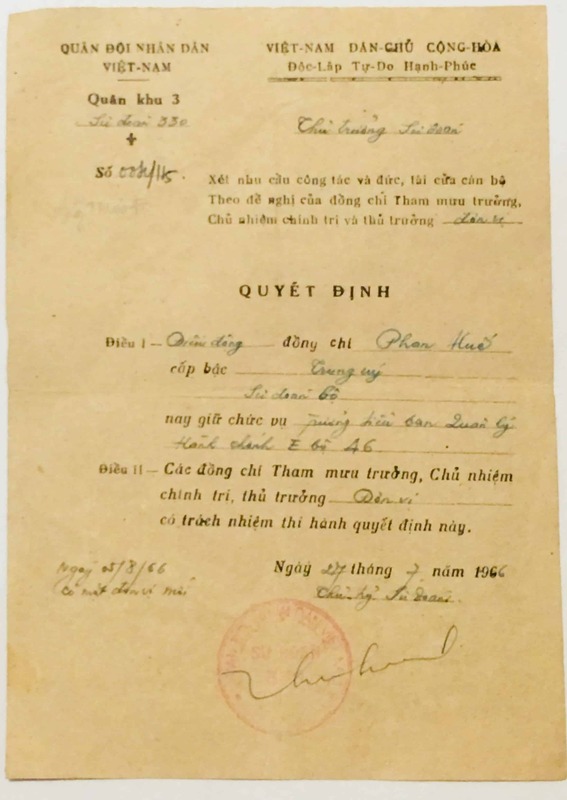 This document appears to transfer Phan-Van Hue to a staff position in the Battalion Staff of the 46th Regiment.